Key Difference: Income can be described as the total inflow of revenue during a period of time. It generally includes the wages, interests, rent and profits. Profit can be defined as the surplus that is remained after the deduction of total costs from the total revenues. Income and profit are very important terms for the economic activities and also find important status in the dictionary of business. Income and profit seems to be connected to each other. However, some confusion may occur regarding the difference between the two as they both are related to each other in many senses. Thus, it is important to understand both these terms and then find the differences between the two. Oxford Dictionary defines income as ‘money received, especially on a regular basis, for work or through investments’. Thus, income can be simply referred as the money that is earned either in the form of revenue or in terms of salary for an individual. 1.Earned Income: It covers all the income that is obtained by working. This kind of income can be earned by sources like- working a job, consulting, gambling, owning a small business etc. It basically includes the earnings obtained from spending time or effort in an activity. 2.Portfolio Income: It can be obtained by the income that is generated by selling an item of investment at a higher price than the cost that current owner paid for buying it. It is also referred as ‘capital gains’. It is generally involved with buying and selling in real estate. 3.Passive Income: it is earned from the assets that have been purchased or created by the person. Renting out a house for the purpose of making money is considered a passive income. This kind of income is generally recurring income. In accounting terms, the income can be described as an excess of revenue over expenses for an accounting period. In these terms, the income is also called as earnings or gross profit. Changes in income can be contributed to factors such as education level, globalization, economic freedom, peace, purchasing power, etc. In economics, income is defined as, “the return accruing for a person, or a nation, derived from the "factors of production": rental income, wages generated by labor, the interest created by capital, and profits from entrepreneurial ventures.” Incomes can be calculated for an individual, a family, a state and a country. Incomes of individuals, family and state contribute to the income of the country. Profit is generally expressed in terms of money that a business makes after accounting all the involved expenses. The expenses shall cover all the costs and taxes involved in a business. The business activity could be small or even bigger, but the definition of profit remains the same. For example, if a person buys a pen for a certain amount and sell it to a greater amount then, in this case the profit earned by the person would be simply equivalent to (selling price of pen- cost of pen). 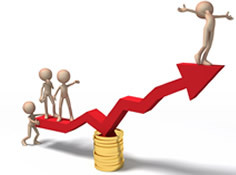 Gross profit: it refers to the mount of revenue from which trading expenses have been deducted. 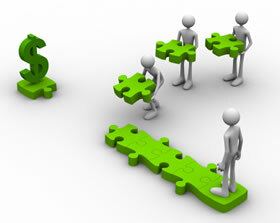 Trading expenses can be expressed as the expenses that are related to the main activities of the business. Net profit: It considers incomes from main and other activities; similarly the expenses incurred towards main as well as other activities are also taken into account. Income indicates the amount that is earned, whereas Profit can also said to be positive number that is obtained after subtracting expenses from the income (revenue). However, in accounting the terms income and profit may be used interchangeably.